This humidity is not good for the Irish. I am a frizzy, sweaty mess and I know I’m not alone. The vast majority of us struggle in this “close” weather, and I therefore despise any people I see floating along in beautiful dresses free of dampness with glossy locks bouncing in the breeze. I want to sit on a bench with a fan pointed at my face and throw rocks at them while eating a Tangle Twister. (And yes, I know they’re called “Twisters” now but this old dog refuses to learn that new trick). Who’s with me? Adding to the sweaty/frizzy disaster is the fact that I’m peeling. Last week I arrived home from Ibiza glowing, exclaiming “I’m so brown!” every five minutes. Now, with every bit of skin that expelled from my body a tear falls from my sweaty eye as I kiss that dream goodbye. But hey, at least it’s sunny right?!? In a moment of what I can only assume was humidity induced insanity this morning, I bought a pair of shorts. I’m wearing them at the moment. They are khaki. I’m not sure about them. As a girl who is closer to 18 than 8 when it comes to size I’m not sure if I’m breaking some kind of rule in getting my thighs out for all to see. They are comfortable though…oh God, have I reached the stage in my life where I dress for comfort?!? 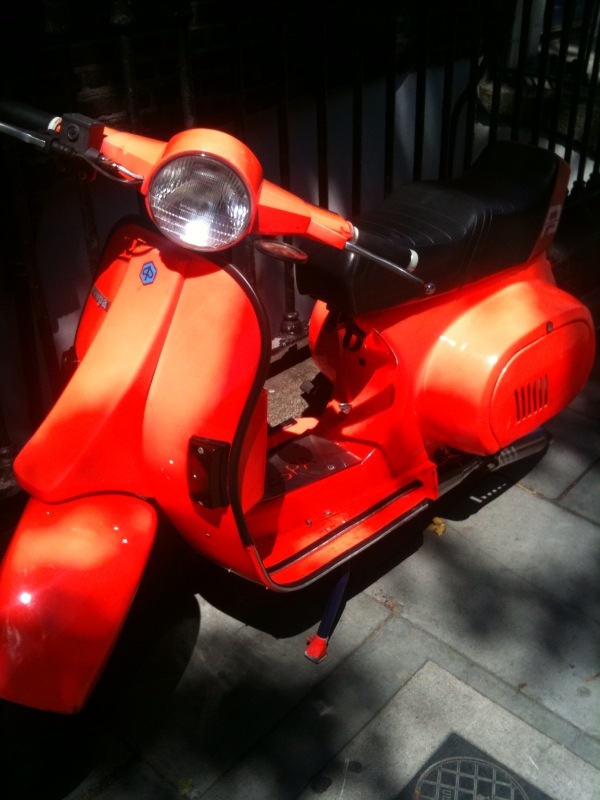 I walked by this vespa today and had to stop to take a picture. Want. Now. It’s neon orange and from 1992. What could be better than that? I like swinging. [insert obvious joke here] While in Ibiza I had a grand auld swing at about 4am in a children’s playground and am considering sneaking around the corner to the neighbourhood playground tonight for a go. It’s a cheap thrill people, and in this economy it’s exactly what we need. Have missed your takes and openness while ya were away. Swinging is the BEST!!!!! there was a swing in the back garden of my gaf in Dublin this year. could NOT get enough of that shiz.! !